How often do you slip on a new shoe and feel like it was made for you? It doesn’t happen very often. The other issue with new shoes is that whole breaking-in period, which can wreak havoc on your first workout or two together. That’s why I love the K-Swiss Tubes, a new sports shoe from the popular shoe maker. Straight out of the box I felt like the shoe wrapped and hugged my foot for a perfect fit. And I didn’t have to go through any of that breaking-in nonsense, they were comfortable from the start. If my word isn’t enough, maybe Jillian Michaels‘ will be. She was seen wearing a pair of K-Swiss Tubes during her Ellen appearance last month, in which she showed the talk show star a few at-home workout moves. In these shoes, it’s all about the built-in cushioning in the soles, their patent pending “sole technology.” Rather than a flat, sealed sole, it’s comprised of a series of cylinders that absorb the impact from a run and allow for more flexibility. At times I felt like I was walking on air. The other thing I love, you won’t feel like you’re making a substantial investment when you make the purchase. 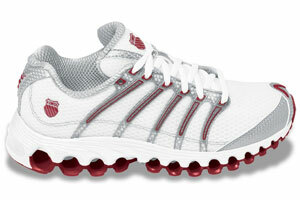 For women and men, the K-Swiss Tubes are only $75! I was shocked when I saw the price. I’ve had far less comfortable shoes that weren’t designed nearly as attractively that were twice that much. So, if you’re in the market for a new sports shoe, and you want something comfortable yet durable that will support you through a run or a workout, that looks good when you wear it and easily fits in to your budget, then consider the K-Swiss Tubes. While K-Swiss provided Brandi with sample product, this review is her own opinion and was not influenced or sponsored in any way.